Motels Plano: Find a Room for Thanksgiving at our Motel! While we are just now shaking off the winter and beginning our preparations for all of the fun things we’re going to do over the summer, don’t forget that summer never seems to last as long as you want it to. If you’re looking to the fall and you’re considering spending the holidays with friends or family in the Plano and Dallas areas, it’s never too early to book a room. 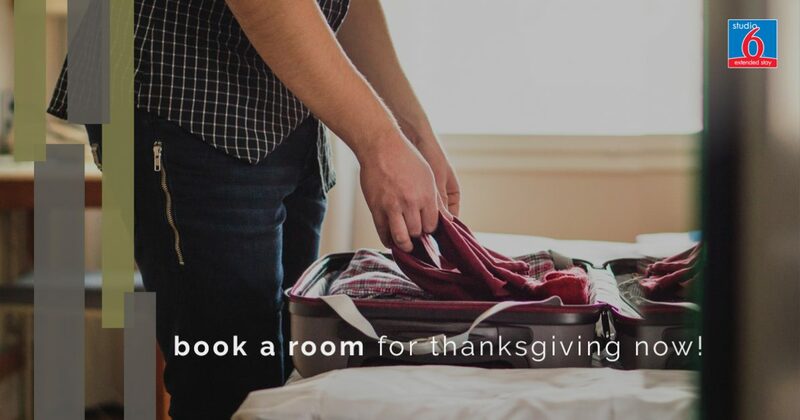 If you want to make your trip a long one, make sure to book your room with Studio 6 in East Plano for Thanksgiving! Read on to learn about all of the ways that our hotel is the right choice when you are booking a long trip, have your family with you, or when you are traveling with your pets. Our newly remodeled rooms are available at great weekly and monthly rates, so don’t hesitate to get in touch with us when you need to find a great hotel in Plano. When you book your room with us before the busy season, you will save money. The closer it gets to the holiday, the more likely our rooms will fill up, and the higher prices will go. Plan your trip early and have your choice of our great rooms at prices that no one else in Plano or Dallas can beat! If you are travelling with your family, our suites are an excellent way to save money. Don’t bother paying for two hotel rooms when you can get a suite that has enough space for everyone! No one has nicer hotel rooms and hotel suites than Studio 6! Each of our rooms features a full kitchenette. Not only will this help you save money by not having to eat at a restaurant for every meal, it is a great way to spend time with your family! We have the cosiest furniture in town! Seriously, you won’t want to get off of the couch or out of bed in the morning. Free Wi-Fi. Stay connected to what is important. Kids always stay free. Most of the fun of travelling somewhere for Thanksgiving is having your children with you. Make new memories without burning through all of your savings. We welcome pets! Your dogs and cats are like family, and you can’t celebrate the holidays without your family! What our amenities and rates mean for you is a better trip. Spending a few weeks in Plano doesn’t mean that you have to break the bank and it doesn’t mean that you have to sacrifice comfort. Enjoy the holiday season by bringing your family to Studio 6 in East Plano for Thanksgiving or any other time of the year! Our location is conveniently located, and safe, so come stay with us when you need the best hotel room in the area. If you have more questions, check out the rest of our site or feel free to reach out. We would love to show you why Studio 6 is the right choice for you!